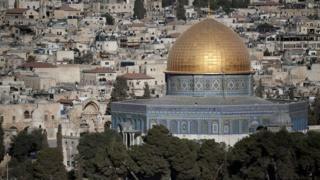 Clashes have broken out between Palestinian youths and Israeli forces at the al-Aqsa mosque compound in East Jerusalem. Police said the Palestinians threw stones and fireworks at officers, who responded with "riot dispersal means". The violence follows weeks of tension and a number of confrontations at the site. The al-Aqsa mosque is part of the Temple Mount/Haram al-Sharif compound, which is one of Islam's holiest sites and the holiest site in Judaism. The site is a source of religious and political tension between Israelis and Palestinians and a frequent flashpoint for violence. No injuries or arrests were reported after the brief exchange on Sunday, which occurred hours before the beginning of the Jewish festival of Sukkoth. Dozens of Palestinians entered the compound overnight, fearing that large numbers of Jews would visit because of the festival, according to the AP news agency. A small Jewish group, the Temple Mount and Land of Israel Faithful Movement, has called for a march to the compound on Wednesday, AP said. Israel recently issued a temporary ban on Jewish visits to the compound and lifted all restrictions on Muslim worshippers to ease tension during the Muslim Eid al-Adha holiday. Muslims who use the mosque have reportedly been alarmed by an increase in visits by Jews and fear rules governing the compound will be changed. Jews are allowed to visit but not pray in the compound, to avoid any perception of change to the status quo which has existed there since 1967, and to avoid an inflammation of tension with Muslims. Tensions have been running high in Jerusalem since Israel Defence Minister Moshe Yaalon earlier this month banned two Muslim groups which confront Jewish visitors to the compound. Sunday's clashes came on the final day of Eid al-Adha.